So I decided to leave my more modest beach attire at home and to shop for something locally. The trauma of trying on a myriad of the largest swimsuits I could find – some of which didn’t seem to provide any coverage whatsoever – lasted only about an hour. Eventually I managed to settle on one that was remotely passable for me. When in Rome right? Joking aside, I love Salvador. The energy of this place is like no other. 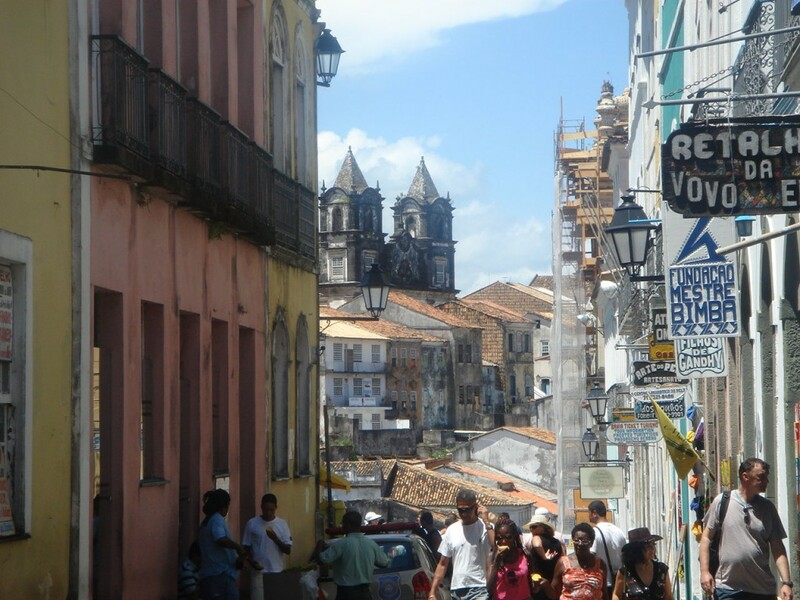 It’s intoxicating, and combined with the sunshine and heat, Salvador feels like sheer bliss. It’s so relaxed here that even an embarrassing (too embarrassing to share) encounter (like I said, the locals have no modesty) with a local gentleman (??) left me amused rather than annoyed. So as I write this, swinging in a hammock on the balcony of my friend’s apartment overlooking the beach, I can’t think of any other place that I would rather be. There are probably a lot of other wonderful destinations that are great for escaping the British winter, but for right here, right now, this spot is absolutely perfect. I’ve also been quite excited about the prospect of the food in Brazil. But rather than the all-you-can-eat-meat gorge fest of a churrascaria that Brazil is well known for, it’s been the fruit that I have been looking forward to the most. While I never get excited about fruit in the UK, the prospect of eating fruit in a tropical climate has tantalised me for weeks. To me, the papaya in Brazil tastes better than in any other place in the world. 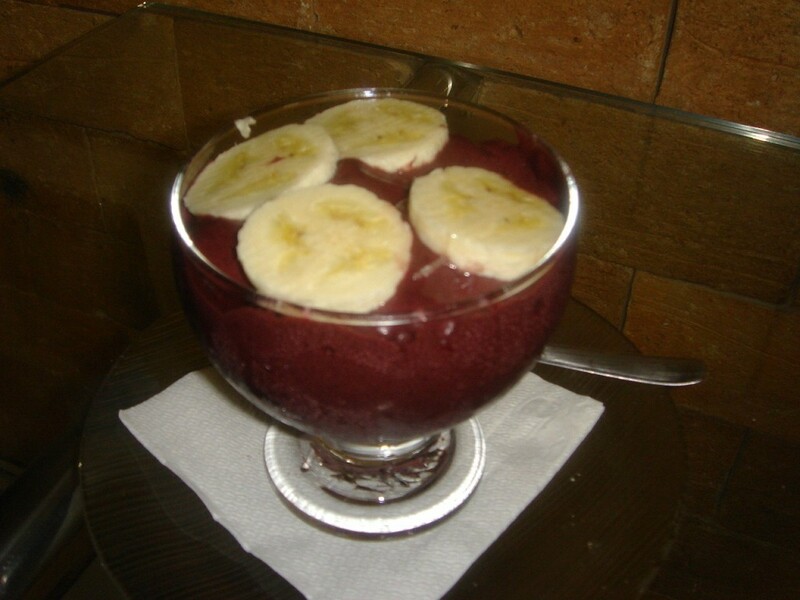 And then there are those varieties that are native to Brazil such as the açai. Famed for its nutritional properties, it is rich in antioxidants, vitamin B, fibre, protein, omega 3 and 9 fatty acids and other vitamins and minerals. Purple in colour, it is harvested for its pulp (the fruit is rarely seen whole), and is typically sold in shops in a sorbet-type form with banana and granola. Brazil’s most famous dish is the feijoada, a meat and black bean stew first brought over by the Portuguese. 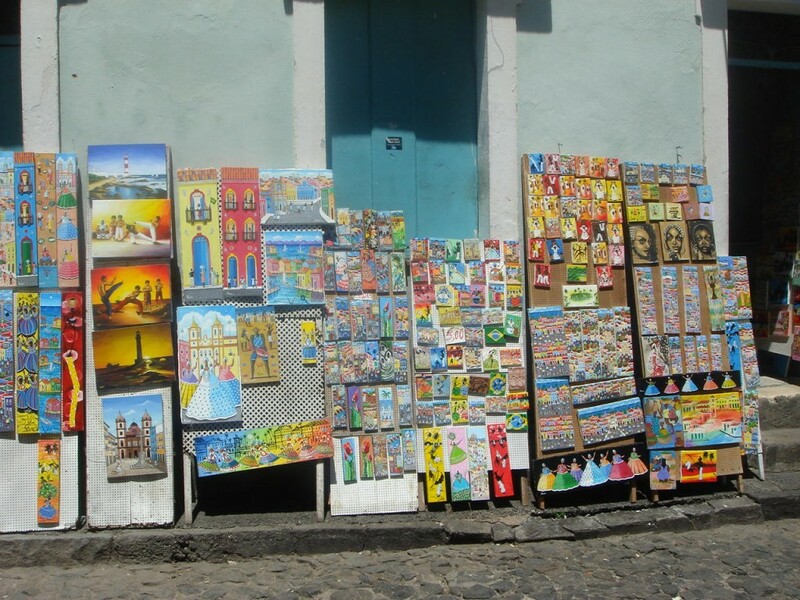 But Bahia also has its own specialities. 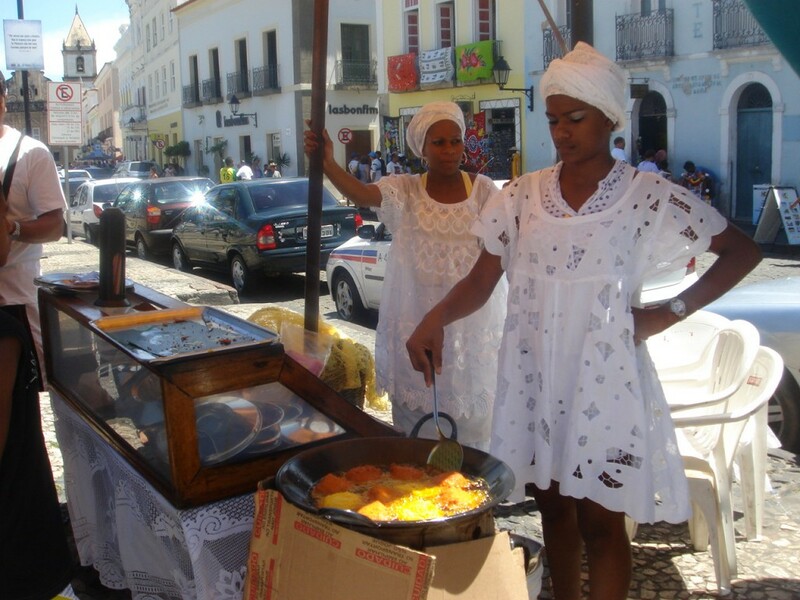 Bahia had the highest influx of Africans during the days of the slave trade, and the influence from those times can still be seen in its cooking. The use of palm oil (dendê), an ingredient commonly found along the tropical belt of Africa and Southeast Asia, is prevalent in Bahian cooking. 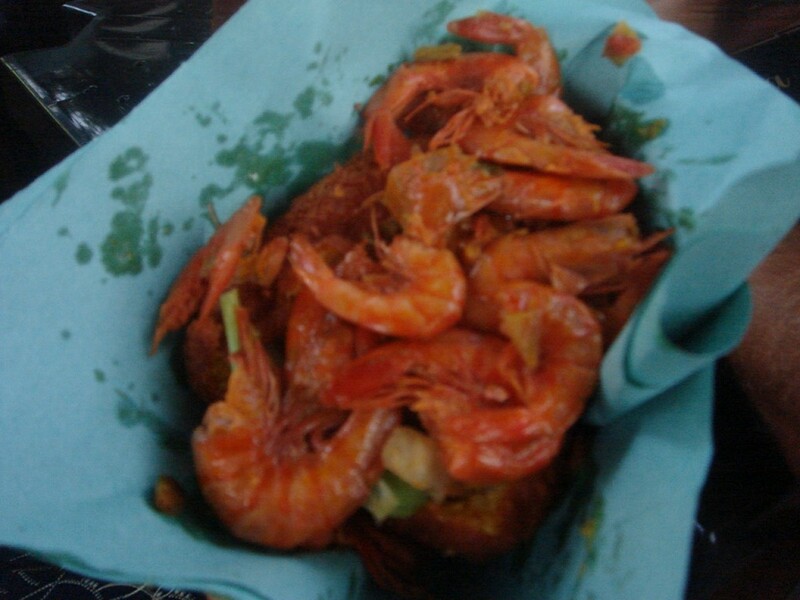 An example of its use can be found in Bahia’s most common street food, acarajé. Black-eyed peas are used to form a ball which is fried in palm oil. Once the ball is cooked, it is split open and filled with vatapá (a paste made from bread, shrimp, coconut milk and palm oil), shrimp (eaten with the shells on) and pimenta (chilli sauce – optional). 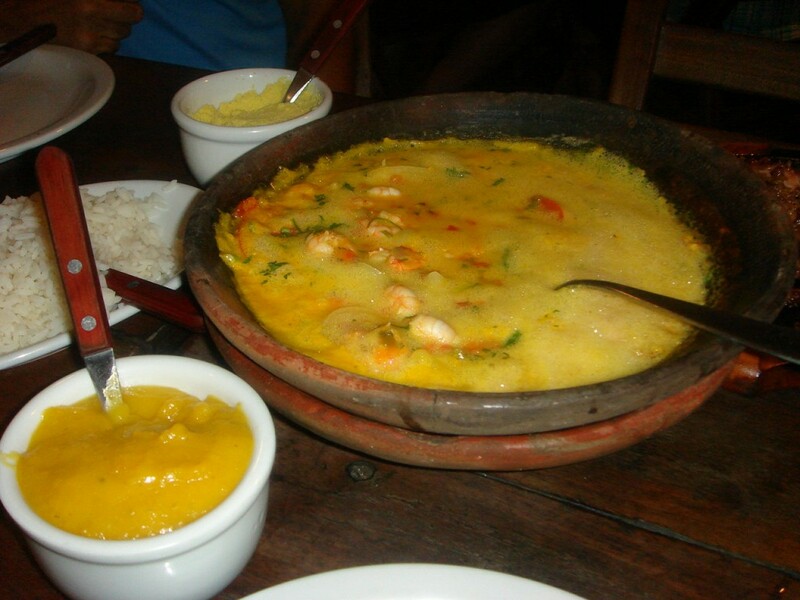 The seafood stew, moqueca (prounouced mo-ke-ka), is another Bahian dish, (the state of Espírito Santo in the South of Brazil also has its own version), and it also contains palm oil. Its other ingredients include coconut milk, onions, garlic, tomatoes, cilantro and chilli. We tried a prawn moqueca (for two people – R$31.90 (about £12)) at a branch of the chain restaurant Caranguejo de Sergipe in the suburb of Barra in Salvador. The moqueca was excellent with a rich, creamy flavour. The taste of the palm oil was clearly discernible but it did not overpower the dish. Moqueca is typically served with rice, farofa and pirão. Farofa is toasted manioc flour and is commonly seen as a food accompaniment in Bahia. When mixed with the moqueca it provided the dish with a light, crunchy texture. Pirão is made by mixing manioc flour with fish stock and palm oil. It has a creamy texture, is similar to polenta, and has a root-like taste. It was flavoursome in a stodgy kind of way. 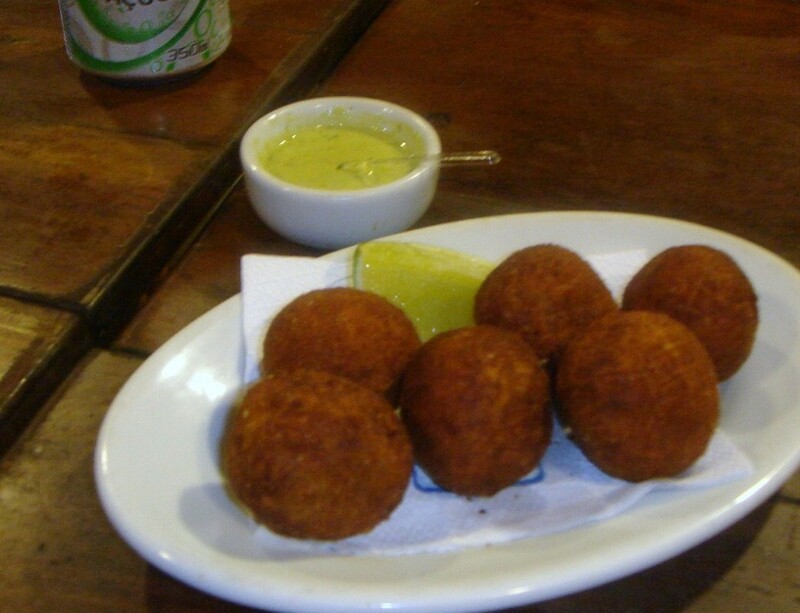 We also tried a serving of bolinho bacalhau (salt cod fishballs) (R$10.90 (about £4). These were also brought over by the Portugese. This version was very tasty, not too salty, and had a nice crispy coating. It was served with the hot chilli sauce (pimenta) that the Brazilians love and which had a real kick to it. 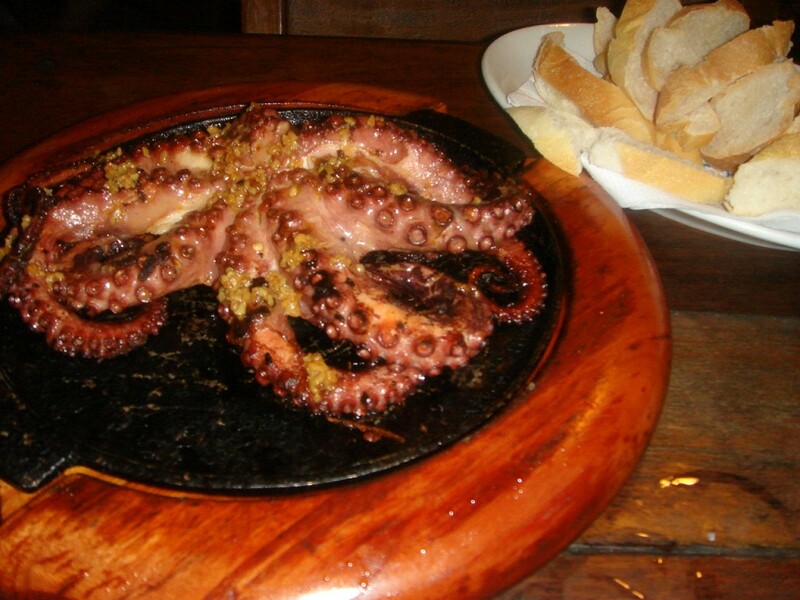 We also went for a serving of grilled octopus (R$29.90 (about £11)). A substantial portion, it was extremely tender, but a little salty. Caranguejo is the Portugese word for crab, so smallish crabs (R$4 each (about £1.50)) which need to be de-shelled are also available for purchase at the restaurant. 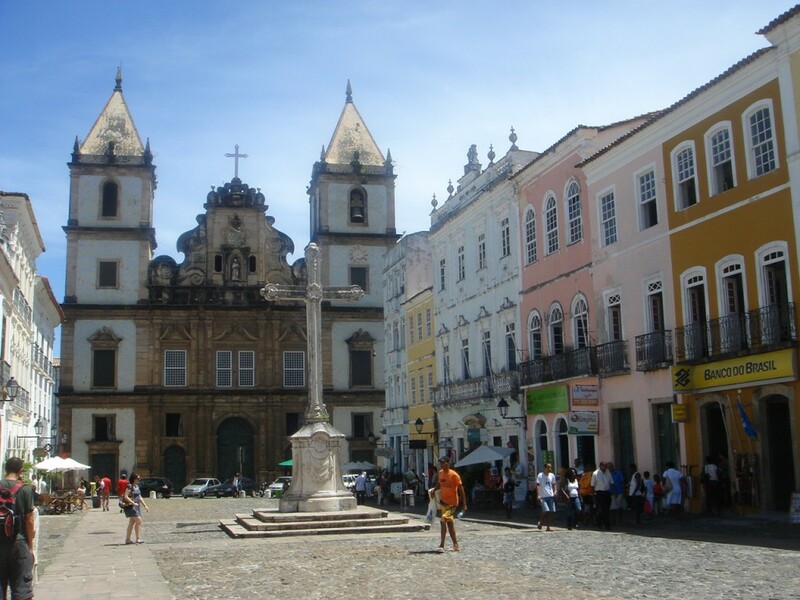 Caranguejo de Sergipe is a restaurant that is popular with locals. A casual sort of place, it was busy and atmospheric on the night of our visit. The service was very friendly, and with its patio seating, it was a nice venue to try some good local food while watching the world go by. Thanks! The weather in Europe sounds a bit horrendous at the moment. Stay warm. I see that you’re next door to me now…my neighbor to the north of Uruguay! 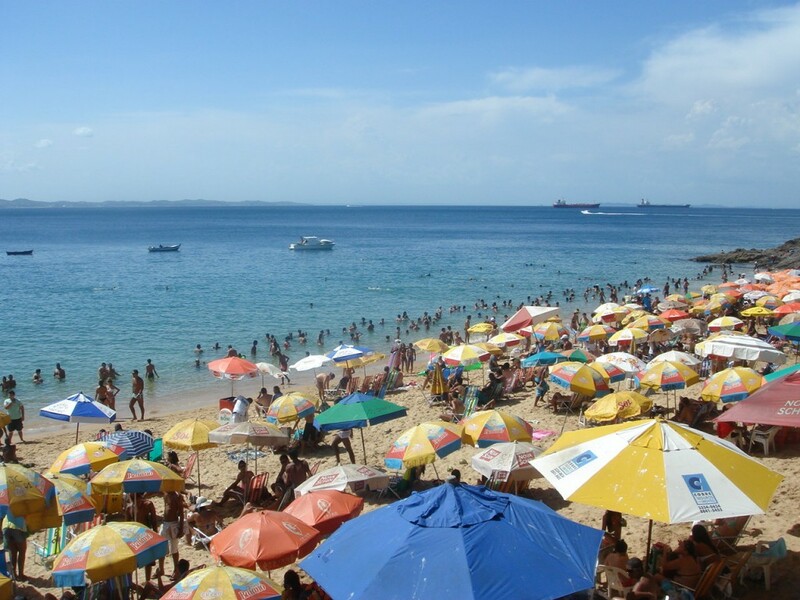 I won’t be getting to Brazil this trip, but your posts really make me wish that I’d spent a sizable chunk of time there. Actually, I’m saving Brazil for a separate trip later, if possible. I’m glad to see that you’re having such a good time and eating such great food. Enjoy the rest of your trip!